Last year we went on a road trip to Croatia. Of course, we took the Tesla for this. I also made a blog about this, which you can find here. After that trip, both the kids and my wife were so impressed by the country, they wanted to come back again this year. So, majority rules and our destination for this year was quickly set. It wasn’t even questioned whether or not to take the Tesla again! Going back to the same country and visiting some of the same sceneries and vacation homes, I couldn’t just write another blog post about more or less the same. So, this time I decided to create a video about it, which you can find below. Part 1 covers our trip from home to Dubrovnik, with scenery from the trip, but also our day trips to the Plitvice Lakes, Dubrovnik itself and Kotor, Montenegro. Enjoy! In part 2 we head back home from Dubrovnik, but stop along the way at Omis, Trogir, Zadar, the Kornati Islands and Krka National Park in Croatia. We also stayed in Postojna in Slovenia, where we visited the largest caves in Europe and the largest cave castle in the world. This time we traveled 4697km and drove through 9 different countries in total! If this article has inspired you to buy a Tesla, you can use my referral link http://ts.la/steven1007 to get free supercharging on your new or inventory car. In the first part of this blog post series I discussed the different supercharger rates and what effect of weather and battery condition have on it. In this second part of my blog post series about the basics of driving a Tesla car, I want to focus a bit on the range anxiety of electric cars and the many remarks, consternations and questions I’ve seen on the different forums. I will speak for the most part from my experience as a Model S driver. I have no real-world experience with a Model X, but it is obvious that because the Model X is heavier and is less aerodynamic than the Model S, it will consume more energy. This is also demonstrated in the first image below, where the NEDC range is depicted for both cars. 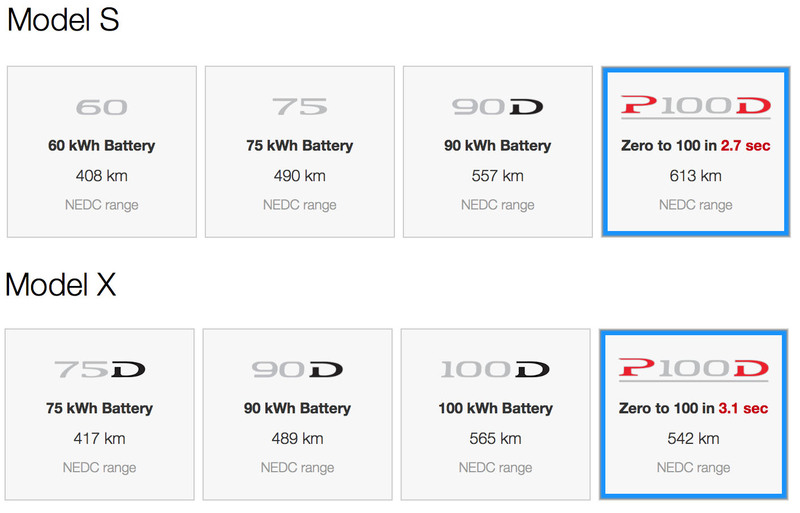 When I bought my P85D, the advertised range for it was 507km NEDC. The newer cars with the 100kWh battery can do up to 632km NEDC. Now what does that mean in the real world? To understand that, we need to dig a bit deeper into what exactly NEDC is. For starters, it is an acronym that stands for New European Driving Cycle. This is the standard driving cycle that is used in Europe (in the US this is called the EPA) for determining the consumption and emission levels of the car. In essence, it is an attempt to get an independent control organisation to rate all cars objectively. Now, I say it is an attempt, because the driving cycle and conditions they use is not related to any real-world situation at all. The cycle must be performed on cold vehicles (no warm engines allowed) and in around 25°C surroundings and usually, for repeatability, on a roller bench. There’s the biggest problem already. The roller bench does not have the same friction coefficient as the real roads, does not mimic different types of road surface and certainly does not account for additional friction in corners. They try to compensate for this by using reverse torque on the roller bench to emulate the wind and surface resistance, but it’s no real substitute for the ever-changing conditions in the real world (wind gusts, different road surfaces, cornering forces etc.). I’m not going to get into the nitty-gritty details of the test cycle down to the second here. There are plenty of resources where you can find those. But both urban and extra-urban tests are done and then combined to get an average weighted value, which the car company can then advertise as the range of the car. Understanding that these numbers are set by an independent organisation and every car has to get their rating through them, that means every car should be comparable to any other car, right? Well, for electric vehicles, they have a different cycle, since they can’t run the car stationary for some time, or they don’t need to change gears and such. So, comparing NEDC range of non-electric cars (ICE cars as they are sometimes named, where ICE stands for Internal Combustion Engine) is like comparing apples and oranges. When you go to the settings in your Tesla, under the “Language and Units” tab you can choose to have your range displayed as “Rated” or “Typical”. But what does that mean? Well, the “rated” option displays you remaining range in terms of NEDC range. That is also why it is called “rated”. This range doesn’t mean anything in view of realistic range at all. It is based on a calculation that is purely theoretical (as explained above) and if you use that setting, you will see that the range drops way faster than the actual driving distance. 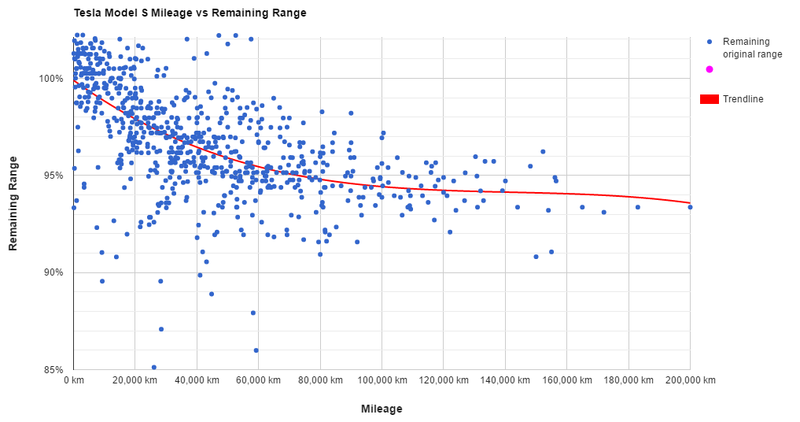 So, while it might be fun to see you’ve got over 500km of range, don’t count on it unless you plan to drive a constant 30kph. “Typical” is a more realistic setting and uses an average energy consumption of around 183Wh/km for a Model S. The actual number varies from car to car because no 2 motors or battery packs are exactly the same. But it is around that number for the regular S. The P will be slightly higher and closer to 188Wh/km (in my case). That means that if you drive at the average consumption of 183Wh/km, you will be able to get the same range as what the car displays. If you go higher, you will get less and if you go lower, you will get more range out of a single charge. Now, while I don’t have personal experience with the Model X, this number is something you can easily calculate for yourself. Since it concerns the actual driving range of your car, you just need to charge to 100% and drive in one go to 0% (or close to it, but no more than 5% left). On the trip widget you will see the consumed energy of that trip, which is, for example, 72,4kWh. Assume you have 5% left. Then you extrapolate what the consumption would be at 100%, which in this case would be 72.4 / 95 * 100 = 76,2kWh. This is the amount of energy you can practically use from your battery (in this particular case we’re talking about an 85kWh battery pack). Then you charge back to 100% and see what number the car displays. Assume the car displays an indicated typical range of 411km (the original range of my P85D when it was brand new), then it’s easy to calculate that 76,2 / 411 = 185Wh/km. In the meantime, I have some 70.000km on my car and have experienced some battery degradation. Recent calculations have shown I have about 73kWh left of usable energy, but also a 100% range of 387km. This results in a typical consumption of 188Wh/km. Batteries also degrade over time, but data has shown that for a Tesla battery pack, the loss is minimal and even after 100.000km you will still average nearly 95% of its original capacity having been through several hundreds of cycles, as shown in the data graph below. Be aware that Tesla has been known to change this number in subsequent updates. 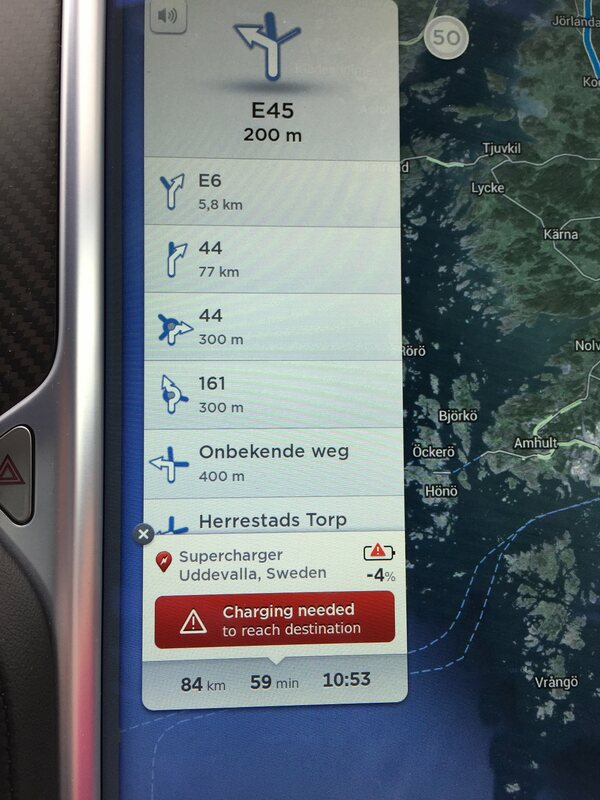 So, before an update you could have 411km of range and after the update, the same charge reads 400, for example. There is nothing wrong with the battery. It’s just the algorithm that has slightly changed to become more realistic. Now that you understand where those numbers are coming from, it is easy to understand the real-world range of a Tesla is unlikely to match the advertised range. There can be so many factors at play here, that it is impossible to get to the bottom of all of them. But I’ll try to go into details on a few of them. This will probably be the single most important factor of your car’s real-world range. NEDC test are designed to run at certain speeds for a certain amount of time. If you are traveling at higher speeds, you will consume more energy. Also, it is a heavy car with a lot of torque. Therefore, it is only logical that it will take more power to get going quickly than when you are driving a lighter car. So, if you gun it at every stoplight, that might be a lot of fun and especially in a Tesla, this never gets old, but you will consume a considerate amount of power more than the NEDC test will. But that goes for any car, not just an EV. Tesla makes very efficient electric cars, with low drag coefficients and efficient motors. However, there is a difference between the P and non-P versions of the car in the sense that the P version has a physically bigger back motor. It generates more power to the back, making it a semi-rear wheel drive. Well, at least for the dual motor cars. For the rear-wheel drive cars, there is off course only 1 motor, located at the back, which is replaced with a larger one for the P85 and P85+ cars. But in both cases, the smaller motors are less powerful but more efficient than the larger one. Because of that the P version of the car will always have a higher consumption than the non-P version. In essence it comes down to optimizing a motor to certain aspects. For example, certain motors can give you ludicrous 0-100km/u times, but they run very inefficiently at low speeds where there is not a lot of torque needed. You can’t have both, so Tesla has to choose the right parameters for the purpose of the car. That is why the P cars have fundamentally different rear motors than the non-P cars. The P is set up for speed and less for efficiency. But that doesn’t mean the non-P cars are slow by any means. So, how come the dual motor cars have higher range than the single motor versions? It all comes down to efficiency. When they can use 2 smaller motors that are more efficient than one larger motor, they can not only offset the additional weight, but even improve on range. And that is combined with improved handling and traction at the same time, contributing to safety on all road surfaces. Isn’t that a win-win situation! Wheels and tires also have an effect on range and that is actually measurable. Of course, it will be clear to you that there is a difference in energy consumption between 215mm tires or 265mm tires, just because the latter one has more contact surface with the road and thus more rolling resistance by nature. But the drawback of using more energy comes with a very high bonus of additional grip. Especially with sticky summer tires, this difference is noticeable. So, when choosing your tires, you have to be aware of what you’re aiming for: do you want to sacrifice a little bit of range (about 3%) with the sticky 21” summer sports tires for the additional traction, or do you want to go full out for the efficiency of the car and increasing range as much as possible. If you go for the first option of performance tires, then Michelin Pilot Sport or Pirelli P Zero are your best choices for this car. If you want to go for efficiency, then Michelin Primacy or Goodyear Eagle are the better choice. Also keep in mind that for the first 1.000 – 1.500 km the tires need to be broken in and will consume a bit more. After that period, they will get their range as expected. Next to the impact of the tires, the rims or wheels also have an effect on range. There is a weight component involved obviously. Steel rims are much heavier than aluminium ones. This weight difference can be significant enough to make informed decisions and that is why hypercars, such as certain Laborghini’s and the Pagani Huyara actually have carbon fiber wheels, which are immensely expensive. 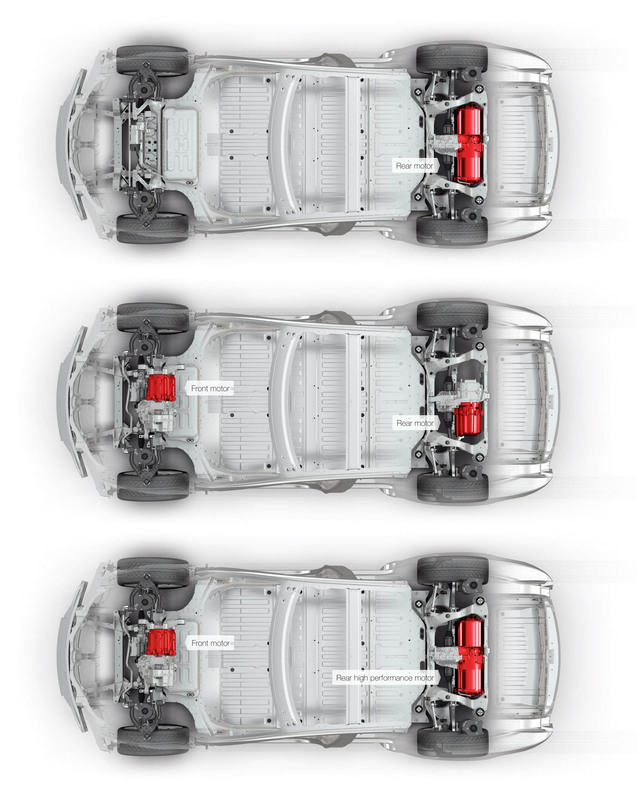 For Tesla, the weight difference in the choices are quite small, since they’re all aluminium wheels. The second factor of rims are the aerodynamics. Some wheels are actually directional, which means it matters whether they are mounted on the left or right side of the car. Some of them draw air in to additionally cool the brakes, while others actual push air out to reduce the creation of air vortices and thus avoid disruption of the airflow, improving the aerodynamic properties of the car. In case of a Model S, the 19” Cyclone wheels (selected in the image above) offer you the best efficiency and least aerodynamic drag on the car, resulting in about 2% more range with these rims at higher speeds. Combine the 19” Cyclone rims with the Michelin Primacy tires and you’ll get about 5% more range than when applying 21” turbine rims with the Michelin Pilot Sport tires. Temperature is an important factor when driving an electric car. This is what catches most new owners off guard when receiving their car in winter. The car tries to keep the batteries at optimal temperature (which is around 22-23°C for lithium batteries in general) to get the best performance and lifetime of the battery pack. This requires some heating to be applied in winter. In ICE cars that heat comes mostly from the engine heat, but in an EV, you can’t reuse that heat, because there is a lot less heat being generated in the motor. Instead, a Tesla has a 6kW electric heater on board. 6kW! That is the same as the small sauna I have at home! Of course this will have an effect on range when you heat the cabin and need to heat up the battery pack during cold mornings. The opposite is true also. When it’s really hot outside, you will turn on the A/C and that requires some additional power as well. But in this case, it will consume a lot less, since the battery is already nice and cosy and unless you’re going to be driving in the Sahara, the cooling won’t draw nearly as much energy as the heating, because the cooling happens mostly via passive cooling, by opening up de dynamic flaps besides the fog lights. Actually, Tesla has a nice range calculator on their website, where you can play with the speed, temperature and A/C settings to see the effect it has on the range. It demonstrates that you can realistically expect to still get about 400km of range on a single charge in winter, on 21” wheels and tires and with the heating on in a 100D. Not bad at all! Some combinations may surprise you, so go and check it out here: https://www.tesla.com/nl_BE/models#range-calculator. Options on the car also have an impact on the weight of the car. Take the sunroof, for example. This weighs about 80kg more than the fixed/solid roof. That is like adding another passenger to your car all the time. More weight means more inertia and more force that needs to be applied to overcome not only the static friction (setting it in motion), but also the dynamic friction (keeping the motion going). More force means more power consumption. It’s not only the roof option than adds weight. It’s also lots of small things like heated seats, adding wood finishes, adding a center console, … All these little things add a little bit of weight to the car, which results in a higher consumption than advertised. Especially because the NEDC tests a base car without any options (normally they do). Next to the options on the car, there is of course the effect on weight of taking your entire family on a 3-week road trip. In my case, my wife, 3 young kids and plenty of luggage together weigh in at an estimated additional 200kg. (And before you start to make fun of my wife’s weight, the bulk of that total is due to the many suitcases in both trunk and frunk). This of course has an effect on the total weight of the car, which on its own is about 2.2 tons for a Model S.
Wind is also an important factor. Even if the car is one of the most aerodynamic ones available today, it still has some drag that affects the driving efficiency. But, just as with all climate factors and surrounding conditions, this is no different from any other car out there. Now, take for example a trip of around 100km in a P100D on relatively flat road. Let’s take somewhere in The Netherlands, from Breda to Amsterdam, to be absolutely sure it’s a flat as possible. Given a load of 80kg for the driver and no head wind at all, you would end up with a consumption of around 18,2kWh. Add a 10kph head wind to the same trip and you end up with 22,5kWh. For a 30kph head wind (which is already pretty hefty) you get 33,4kWh, which is nearly double the consumption compared to no wind at all. Similarly, with a tail wind of 30kph you would only consume 9,2kWh for the same journey. These numbers are not random but calculated with the help of http://www.evtripplanner.com, which is a pretty good tool for calculating whether or not you can make a certain trip and where to charge. I use it to get an indication on suggested spots, but in the end will decide where to charge while driving anyway. But it definitely shows how important the wind factor is for any car. Just keep in mind when you play with this tool, you’ll probably never get a consistent head wind or tail wind anywhere, since you’ll make turns and wind conditions vary throughout your journey. Next to the temperature, there are other weather conditions that can have a rather large impact on your real-world range. Take snow, for example. When driving on snow, I’m sure you can imagine it generating more rolling resistance, because the car sinks a bit in the snow and has to push that out of the way to keep rolling. Similarly, rain has the same effect, but less pronounced. I’m not talking about sand, mud or gravel yet, because you’d have to be nuts to go driving on such roads in a €100.000+ car (which I actually did last summer in Croatia, being very careful though). Which brings us to the last factor in my limited list and that is: terrain. It’s no hardship to understand that if you’re going uphill, you’ll be consuming more energy than when you are rolling downhill. The latter one can be quite funny, because if the mountain is high enough and the road is steep and long enough, you actually might gain a few miles by the time you get to the bottom of it. This is due to the regen happening in the car, actually generating more energy by using gravity than it consumes. So, for example, you could start at the top of a mountain pass with 200km left, drive 25km downhill and end up at the bottom with 210km left. You actually gained 35km driving down and drove those 25km downhill for free, so to speak and added another 10 free kilometres of range in the process. Try that with an ICE car! Again, it all comes down to the same thing and that is: more resistance, be it from rolling or simply the air, requires more force to overcome that resistance and therefore will use more energy. Another thing to keep in mind is the fact that the way you charge your car also has an effect on the amount of energy you get in your car. With this I mean that if you charge your car each and every night to 90%, which is the recommended daily charge level, and you only drive 80km every day, then the battery will always cycle between 90% and let’s say 70% for the sake of argument. Doing so, you will notice over time the indicated range at 90% is less than what it used to be. Again, nothing is wrong with your battery, it is just that the 7.000 odd cells in the pack have become unbalanced. A 100kWh battery pack is actually comprised of exactly 8.256 cells! This means that one cell might be 90% full, the next one may have some more space left. The full ones mark the battery as having reached its intended charge level, thus resulting in a slightly less indicated range. In itself this is perfectly normal behaviour. It is very hard to determine how full a battery cell actually is. You can only know for sure how much you’ve put in and how much you’ve pulled out of it. Fortunately, this is an easy one to fix. Instead of only using that 20% range, you should drive the car until the battery has a low state of charge (somewhere below 10%) and then charge it all the way again. This way all battery cells have been pretty much depleted and filled up again, thus balancing the full pack to its normal capacity again. 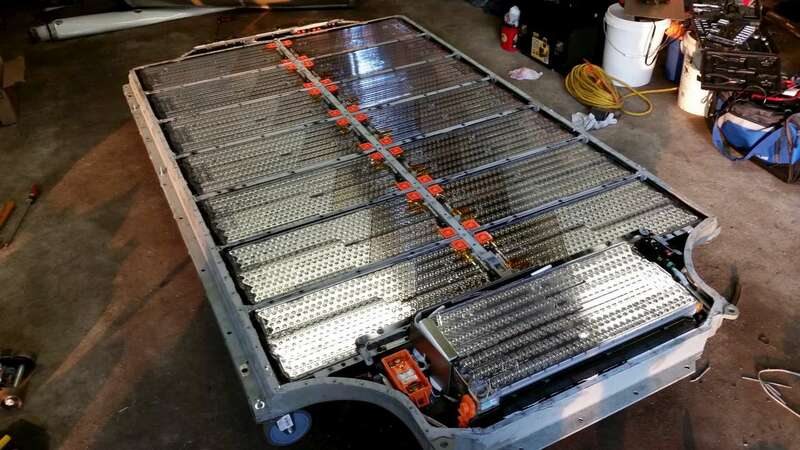 If you want to know more about the composition of a Tesla battery, I suggest reading @wk057’s blog post, because he has deconstructed several of them by now. So, all in all, the real-world range of a Tesla is not a simple number to give. All I can give is the consultant’s default answer: “it depends” So many factors to take into account and so many of them are personalised, like options, tire choices and driving style. The main tip I have for you here is to get to know the consumption of your car with your driving style and don’t let anyone else throw you off by displaying other numbers. They have different cars and different driving styles. Driving a Tesla is addictive. The smoothness of the car and the way it effortlessly eats up the kilometres makes it an excellent cruising missile for cross country road trips. The first year I took it on holiday to Sweden, this year to Croatia and next year we’ll go back, but quite a bit further, all the way to Dubrovnik with daytrips to Montenegro, for example. In between the big road trips I’ve been to Germany, France, The Netherlands and Switzerland for aikido seminars, professional courses, long weekends or short trips. So, I was thinking I’d write this post to give the newer drivers some interesting information about the process I’ve been going through when planning these road trips. As a disclaimer, I must mention that I’m kind of a control freak, so your thought process might vary. Let’s start with the destinations to pick from. Tesla sales people might tell you that you can go anywhere you want using the supercharger network. However, even though the network has grown quite a bit in the past 2-3 years, there are still some “blind spots” where you’re off-supercharger-grid. So, you have to take that into consideration. Does that mean you can’t go there? No. But you sure as hell need to know what you’re getting yourself into if you want to drive distances using only public chargers. But I’ll talk more about that in just a bit. The supercharger network is, as you can see below, quite extensive and allows you to drive an average of 2 to 2,5 hours before you need to charge again. Charging times depend on lots of factors, so there is a rule of thumb you can use (and the Tesla navigation uses that too), but there are too many variables to give any guarantees. Consider it a guideline. Now, how do you know how much margin to take? Well, I’ll give the consultant’s answer and say “It depends” . You’ll quickly find out your personal average consumption rate once you drive the car for a few longer distances. But then you could also take several parameters into account. An important one is elevation. The car’s navigation does quite a good job of taking that into account. But the car assumes its programmed average consumption of around 188Wh/km. This number slightly varies for each car, because of the efficiency of the different motor types: a performance rear motor is not as efficient as the smaller motors in a non-performance car. My lifetime average over 65.000 km is around 220Wh/km, so I factor in an additional 15% consumption, unless it is mostly downhill. That’s the 15% margin I mentioned above. Another important factor that some might overlook, is the climate conditions. If it’s really cold, you’ll use more because of the fact that you will be using a 6kW electrical heater to heat the cabin, but also to keep the battery at the optimal temperature of around 25°C. If it’s really hot, you’ll use only a bit more, because the battery will already be optimal and the A/C uses less power than heating the car. If it is raining, you’ll have more rolling resistance, so you’ll use about 5% more power (from my own experience on 21” summer tires). And if you’re facing a head wind, that will have more impact than you would guess at first. This is no different from any other car. To know what I’m facing on the next leg of my trip, I usually take a quick look at the website http://www.yr.no, which gives pretty accurate temperature, rain and wind predictions in 3 hour intervals. 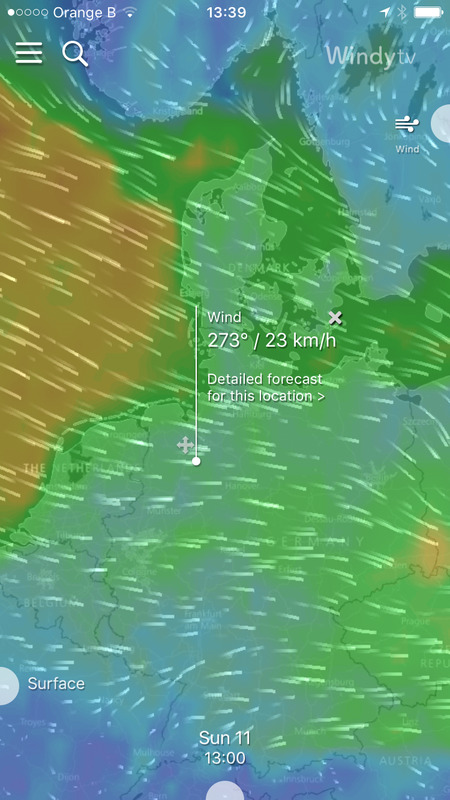 Next to that I’ll look at the Windity app (see screenshot below) which is a realtime wind measuring tool. That way I’ll get an idea of where the wind is coming from and how strong it is on the whole leg of the journey. If it’s a strong head wind all the time, I’ll again take some additional margin. With a tail wind, I don’t add anything, but also not subtract anything, just to be on the safe side. As to driving times and speed, I can say that from experience I can get about 85km/h on average. That includes everything, from start to finish: driving, charging, eating, pit stops etc. For an 850km trip that means it will take you about 10 hours in total to reach your destination. Especially with 3 kids in the back you need to let them stretch their legs and let them play for a bit every 2 hours or so. And that matches perfectly with the charging stops, while at the same time also adhering to the recommended driving and resting times. Coming back from Sweden I did a one day trip back home from the top of Denmark (Frederikshaven) to my house in Belgium, which was 1150km, and was still fresh and not tired at all when we got home. And that was before I had AutoPilot to do most of the highway driving. For me, picking a destination is quite easy. 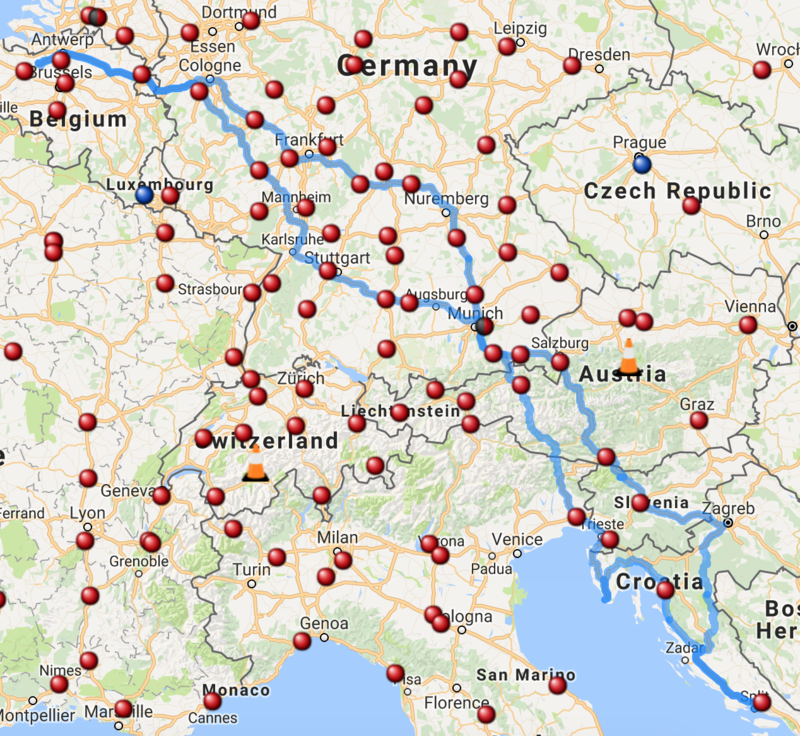 I start with destinations that I would like to visit (or my wife tells me where we are going ) and then I start looking at http://www.supercharge.info (see also screenshot above) to see if we can get there comfortably or not using the supercharger network. 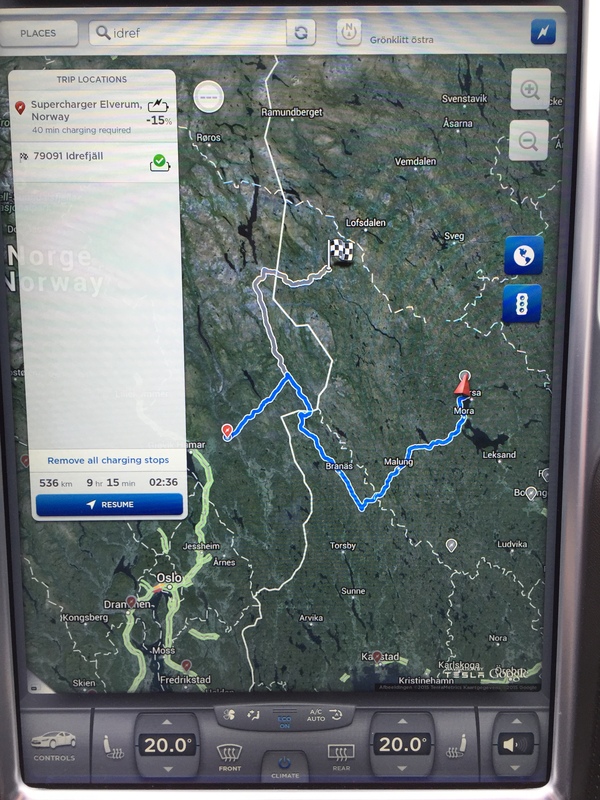 In Sweden for example, we were able to charge at Karlstad, but that was the very last supercharger to where we were going to drive around for the next 2,5 weeks (in the meantime there is an additional charger at Mora that wasn’t there last year). At first it seemed impossible, but that is where the fun starts. In such a situation, I always look for destination chargers. Now, tesla has its own growing network of what they call destination chargers (which can also be found in the car’s navigation system), but in my definition, it also includes any and all possibilities of charging the car wherever you’re staying and not just at hotels. So, when I book an apartment or vacation home (hotels are just too expensive with 5 people), I ask if there is a possibility to charge my car (socket or 3-phase red plug if I’m lucky). I usually also mention the fact that I’m more than happy to pay extra for this, but most of the time they will just reply I can charge for free. Ain’t that nice? However, sometimes there are no superchargers in the area where you’ll be staying (too far away) or you can’t charge at your destination. Then it’s on to the next level and I’ll start looking for public chargers. Is there one in the town or city we’ll be staying? If so, do I need a specific RFID or app to be able to use it? If not, then the problem has been solved and I’ll park there for a while when visiting the surroundings. And if you’re lucky, the public charger can be free too! But keep in mind these chargers are usually slow and you’ll need to spend at least a good couple of hours in that area before you can get going again. But most of the time you will need some kind of charging app or RFID card. That is where the tricky part begins in the sense that there still is not 1 single provider that gets you access to every single charging station in Europe. There is a huge effort going on in these companies to work together and allow each other’s cards on the networks, but there is also still a long way to go. So how do you know which card or app to use? The main website I’m using is http://www.chargemap.com. I know some like http://www.plugshare.com better, but I personally find more information and more accurate information on the first one. There is also http://www.plugsurfing.com, which is rapidly expanding its network. And for the Nordics I use http://www.ladestasjoner.no. Of course, there are many more apps and websites, but these are the ones I use the most and they are also in my favorites list in the browser of my car. These websites and apps usually state who the provider is and whether or not it is free and what charges may apply. Sometimes you can find a charger that says “only for guests of the brand” or something like that. Nissan garages do that commonly, so you probably won’t be able to use those. At least, I don’t count on those. But once you find a suitable charger, you can order an RFID card or download the app and you’re set again. And of course, you might run out of luck after all and don’t find anything suitable for charging and you’ll have to get creative: marinas have boat docks that have power outlets, for example. Talking to the harbour master might get you on the road again. However, you can’t count on that either, since you can’t really call them up front and ask permission. You’ll just have to see when you get there, so that might be a gamble. The most important aspect I want you to remember is that anything that gives electrical power can be used as a potential charging point, providing you have the correct adapter. And I have made a few of my own, so except for the specific and costly CHAdeMO adapter, I can hook up to anything. 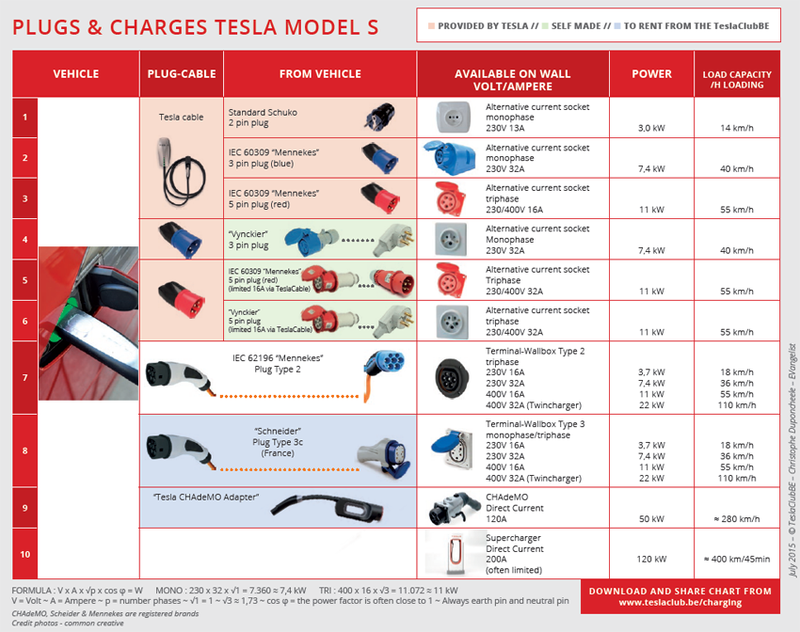 The people from Tesla Club Belgium have made a nice overview of how quickly the different charging options will charge your car as a reference guide (see picture above). I also have a laminated version in my car, but know most of them by heart by now. The second most important thing to remember is the fact that you should always have a plan B with an alternate charging point. That way you don’t have to panic when plan A doesn’t work out, because the site is not accessible, the information was wrong, or it was just occupied. O dear, we have come to the topic of the navigation in a Tesla. There is a lot to say about this and there are people that hate it and people that accept the flaws. I’m in the latter group. The navigation is far from perfect and even some basic functions are missing. But there are ways to work around them and get exactly what you want. Well, for most of the issues at least. The good thing about the navigation is the fact that it can automatically route you on your journey via all the necessary superchargers. It will tell you where to stop and how long to charge (the rule of thumb, remember). But it doesn’t always take the route you want to take. One way to get around this is to select the charger you want to visit next as your next destination. Or you could drop a pin on the map somewhere in that direction, simply by pressing down longer where you want the pin to be. And then that can be your next destination. Sometimes the navigation will act strangely in the sense that it can send you on a detour for a few kilometres and then back again on the highway. Nobody knows (yet) why this is happening, but feel free to ignore it and the navigation will pick up your decision and recalculate the route for you. Another quirk in the navigation has to do with the supercharger routing. When we were in Sweden, we had to drive about 200km to the next holiday home. We started in a place with no superchargers nearby and at the destination I had a public 22kW charging station available. 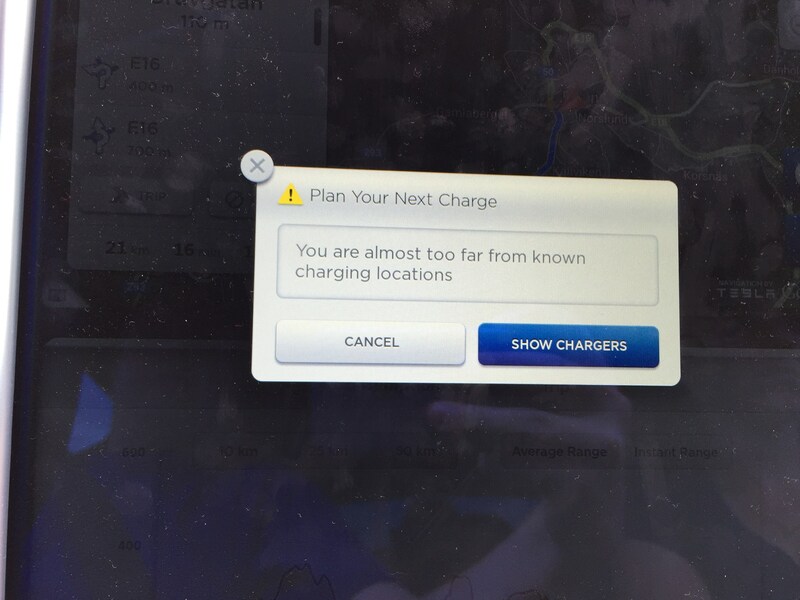 But the car doesn’t know that, unless you’ve charged there before (it remembers all your charging stops). Instead of guiding me directly to my destination, it took me into Norway for a 500km detour, just to visit a supercharger! Quickest way around this one is to hit the “Remove all charging stops” link in the navigation and it will set you right back on track. One of the features in the navigation I like the most is the combination of the Trip consumption prediction and something that Tesla calls “range assurance”. This last one is interesting, because the car will calculate how much energy you will have left when you get to your destination. If that dips below 7%, the car will warn you about this and will suggest a maximum speed to make sure you reach the destination (which could be a supercharger). To do this, it actually takes elevation, actual speed, and climate factors into consideration to extrapolate how much energy you will consume. And you’ll see a nice graph of this in a second tab on the energy app, so you can keep an eye on this if you want. In the 65.000km I’ve driving and the various road trips I’ve done, I have found this to be pretty accurate. Of course, if you start driving 200km/h, the graph will have you panicking at first, but if you realise that the graph will go parallel again with the original estimate once you go back down to normal speed, you’ll know how far you can take it. I use it quite a lot and really like it because it gives me some peace of mind. This very long article seems to be focussing on worrying about where to go and how to get there. But you shouldn’t forget the fact that driving a tesla is fun! And it’s not only because it has a gazillion torques, but because of the ease of driving. Driving through the mountains, you don’t have to constantly shift up and down in hairpin bends, sometimes ending up in the wrong gear and having to shift again etc. The car just takes these roads with such ease that it becomes much more relaxing to drive these sometimes-dangerous roads, because you can focus more on the road itself and at the same time also enjoy the scenery more. The instant torque from the motors also make sure you have no trouble whatsoever to come out of a corner on a steep hill and just get going. The car also has loads of space, both inside the cabin and in the trunk/frunk. It is on par with the cargo capacity of an Audi A4 Avant (the rear wheel drive ones even with the Audi A6 Avant). For me that meant I could leave our Ford S-Max at home and take the Tesla Model S instead. Another remarkable aspect, is that before I drove my Tesla, I wanted to get to my destination as quickly as possible. Now, the supercharger network takes me on other routes on the one hand, but on the other hand I find myself searching for scenic routes to enjoy the journey to our destination as well. I guess I’m trying to find excuses for spending more time driving the Tesla ;-). And last, but not least, you’re driving the most technologically advanced mass produced car on the planet (for now), which includes having Autopilot. This allows you to relax again and have the car help you drive. It takes care of a lot of stuff for you, but you still need to be vigilant, of course, because it’s is still not a self-driving car. Speaking of which, every single tesla that is currently produced (and as of mid September 2016) has all the necessary hardware for full self-driving capability (or so Elon Musk has promised us). That means the hardware is in place, but the software still needs to catch up. But if you look at the clip below, you can see that, even though this is a fixed route, the car can already handle various unexpected and complex situations. Of course, we won’t be getting this update for quite some time. But the future is looking bright. Just think about it: stepping into your car, going to sleep and waking up at your destination. Wouldn’t that be awesome? This future is closer than we think and I think we are all going to be surprised about how quickly this is going to happen. I for one can’t wait to be a pioneer in this game. If this information has been helpful for you and you are planning on buying a Tesla Model S or Model X, please use my referral code http://ts.la/steven1007 and get free supercharging on your new or inventory car. 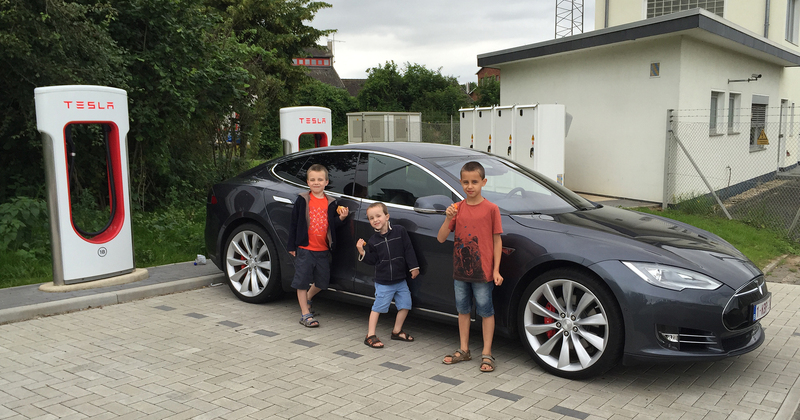 Last year, when we would go on vacation to Sweden with the Model S, it was our first really long journey with an electric car. I had to convince my wife that it would all work out. It was certainly the case, since in Scandinavia electric cars are a lot longer a common sight in traffic than they are in Belgium. A lot more charging stations, so charging options were abundant. 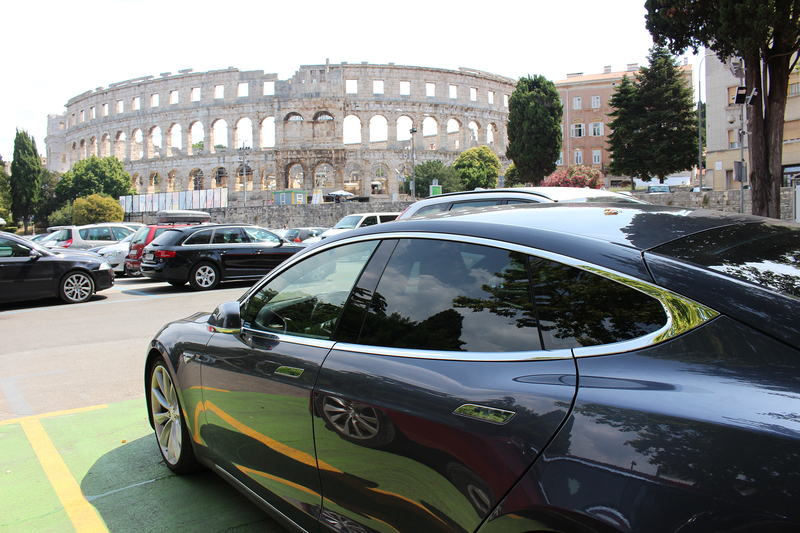 This year we decided to go on another road trip, but this time we would visit Croatia and Slovenia. 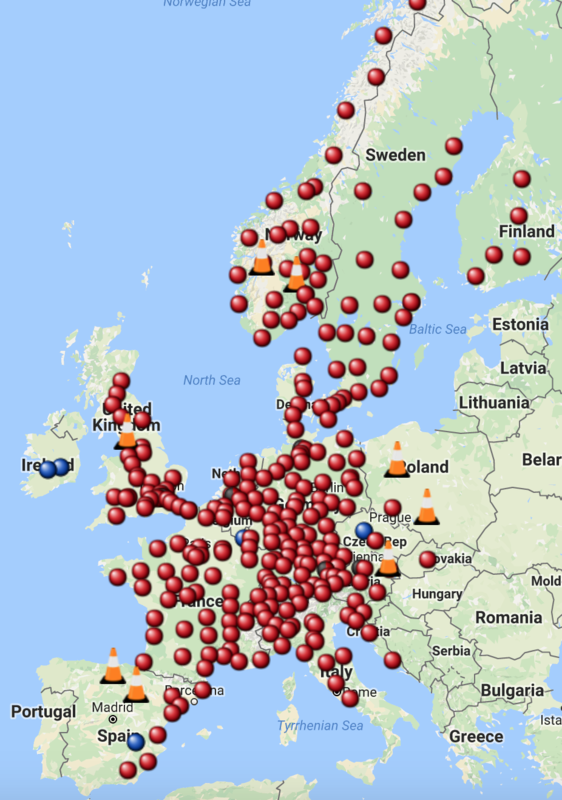 Places where superchargers are not as common as in most West-European countries and the electrical grid is notorious for its unreliability in some areas. But to my surprise we didn’t discuss the question whether or not we would take the Tesla on this trip. 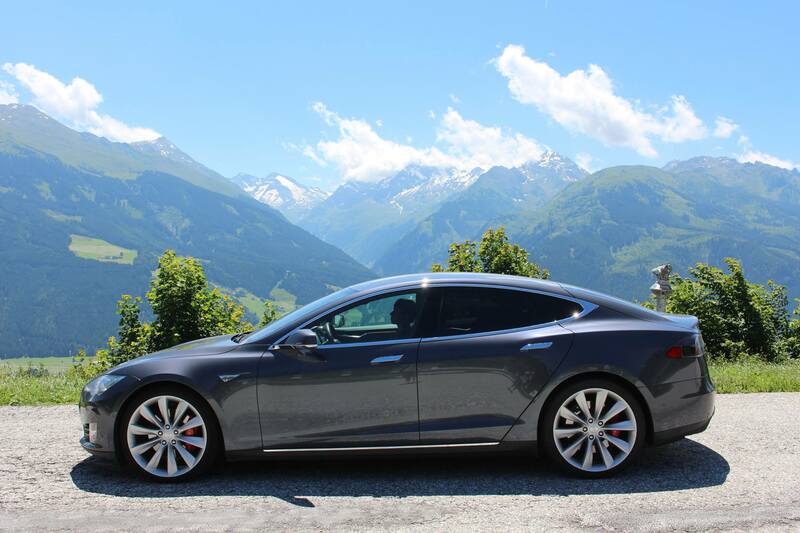 That is how natural is has become for to just take the Model S and go wherever we want. Fuel cost: €0, or a savings of around €400 compared to our other car we used to take on these trips, which is a nice budget we can use to save or to spend on other things. In the statistics I mentioned an average travel speed of 85 km/h for our longer distances. This is consistent with the number I got last year on our road trip to Sweden. At first sight this may seem kind of slow, but if you factor in the fact that this number includes all stops for charging, lunch etc. then it makes a lot more sense. The advantage of driving a Model S is the fact that because you have to supercharge every 2 hours on average, you also have to take a rest for at least 15 minutes before continuing on your journey. Even though this year I once did a 4-hour trip between superchargers, but then we stopped at the “rodelbahn” in Lienz, Austria to take a welcome break from driving. These times are not only the recommended driving times before needing to rest, but it also makes sure that you enjoy the trip itself more, that you take a walk in places you would never stop otherwise (and maybe you discover some hidden treasures). The consequence is that you are better concentrated on the road during the trip and at the same time more relaxed at the end of it. In that perspective I see supercharging as an advantage instead of a drawback. Do I need to plan to get somewhere? I’ve lost count how many times I’ve been asked the question how far you can drive a Tesla. This year I always answered “At least as far as Croatia and a lot further as well”. Of course they don’t mean it in that way, but it remains a questions that hovers around all electric vehicles. It is of course still a fact that electric vehicles are not yet a 100% equivalent of a regular gasoline or diesel car in the sense that you don’t “fill up and drive off”. You still have to adapt and superchargers are not yet everywhere (although Tesla is changing that very rapidly nowadays). But there are enough of them to allow you to travel without thinking about that. The built-in navigation makes sure of that, because it neatly routes you via all the necessary charging stops. And once you realise you shouldn’t fall into the habbit of “filling up”, the adjustment is not too bad. In that respect I try to combine the charging stops with either a lunch break or a nice activity for the kids. This year we only had to wait for the car to be ready 1 or 2 times. All the other times, the car was actually waiting for us to come back and continue the trip. In essence you just have to charge to get to your next charging stop (including some margin of course) and don’t have to charge to 100%, because then you lose a lot of time since charging at higher percentages becomes really slow. So, the lower your charge when you arrive, the faster you can get going again. As soon as you figure out that system and you know the car’s consumption with your driving style, it’s not a big adjustment to go on an all-electric road trip. It is only when you go outside the range of the supercharger network that it takes a bit more planning. In Europe there are quite some public charging stations available, but often you need special RFID cards to be able to use them. It would be nice to have 1 card that can use them all and some companies try to reach this goal. But there is still a long way to go before we get to that point. Often public chargers are free too. Or you can charge in the harbor using the 3-phase red plug, of course only after consent of the owner or harbor master. Besides that, our strategy was to just plug in at the apartments and houses we rented using the standard Schuko household plugs. Those are really slow, but if you can let the car charge for the whole night, you find yourself having gained another 150km of range in the morning. So yes, you need to plan ahead some to charge in the proper locations, but often it depends on your mindset and how much you really want to plan or calculate. Some say “just drive and we’ll see”. However, I’m the kind of guy that wants to have a plan B for everything (yes, you can call me a control freak ;-)). That way I have peace of mind when I test the car’s limits, without ever having the so-called “range anxiety”, which is basically the fear of running out of energy before you reach you destination or charging stop. This year I told myself to get through Germany as quickly as possible (hitting 200km/h on a regular basis), but from that point on to take a little highways as possible. While an added bonus is that you don’t have to pay the vignette in Austria and you can skip some road tolls in Slovenia and Croatia, that was not the main driver of this decision. The real reason is simply because highways are boring. Driving on mountain roads is more challenging, but also more fun. And at the same time you get a lot of amazing landscapes and beautiful views in return. You discover a country in a different, more intimate way than by just getting from point A to point B as quickly as possible. With my P85D in Insane mode, I had all the torque I needed to drive up the mountains with ease. The aspect of the car that I appreciated the most at that point was the fact that you never have to change gears, since there is only one gear. While driving up a mountain road I remembered having to downshift and upshift constantly with our other car that we used to take on these kinds of trips. Every time the fuzz of choosing the right gear (sometimes picking the wrong one) in every sharp corner or steep section. With a Model S there’s no need for that. You just shoot out of each corner without the feel of the car having to work its way up the mountain. Add the factor that it is a 4-wheel drive car and driving on mountain roads is both incredibly safe and a pure joy. One of the cool aspects when you drive around in a Tesla is that despite the fact that they become more prominent in the streets, everywhere you go, people are coming over, asking questions and taking pictures. Some may find that a bit annoying, but I love the fact that I can show of this beautiful machine and I can inform people about living with an electric car. Often they are amazed that we travel that far with a pure electric car and they admire my bravery. But once I explain how it all fits together, they usually say something like “I had no idea this is so easy”. So, any location we parked people were bound to show up, look at the car and ask questions. At every house or apartment we rented, the landlord or landlady usually started the conversation with “Nice car! want to trade with mine?” After that it mostly turned into a conversation of at least 15 minutes about the car: the performance, the ease of use, the range etc. In fact, by now it happens so frequently that my wife has already gotten used to it and she just know I won’t be available for the next 15 minutes or so :-). This year was another successful road trip: stunning nature scenes (and about a gazillion pictures to prove that), beautiful roads, lots of sun and not a single problem with the tesla to get where we wanted to go. From long open highways with smooth asphalt to tiny mountain roads with dusty gravel: it’s all perfectly doable with a Model S. Even the kids immediately said they want to go back. But for me there is still a whole world to explore and so many countries and things we haven’t seen yet. Norway is definitely on the list, but so is Scotland. Or maybe next year it will be Austria or Switzerland? I can’t yet say for sure what it will be. But what DO know for sure is that next year we will be taking the Tesla Model S again. And because of the continuously expanding supercharger network it will be even easier to cover those long distances. By the way, if you are on the verge of getting a Model S or X yourself, please use my referral code ts.la/steven1007 and get free supercharging on your new or inventory car. 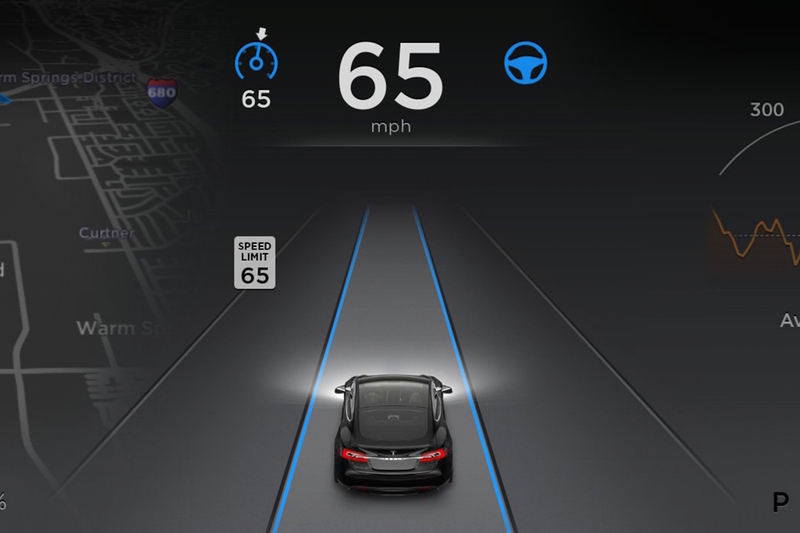 Tesla’s AutoPilot: a simple driving aid or being driven? Last week I had to go to Amsterdam (The Netherlands) for my work and right after that I was going to drive to an aikido seminar in Stuttgart (Germany) for the weekend. Coming from Belgium, that meant that I had to drive 1600 km in 3 days. Actually, make that 1.5 days, because on Saturday and Sunday morning I was training hard while the car wasn’t moving at all. So this seemed to me a perfect test for Tesla’s recently released AutoPilot feature. Now, I do call it AutoPilot, but actually it is a set of features that Tesla has been releasing gradually over the past year. Let me start by explaining what the system is and especially what it isn’t. Autopilot is the software that makes use of the car’s front camera, the front radar, the GPS and 12 ultrasonic sensors that scan 360° around the car. Those capabilities combined give you a list of intersting and useful features. For those of you already familiar with Autopilot, you can continue reading here. TACC: Traffic Aware Cruise Control. This is just another name for Adaptive Cruise Control or Radar Guided Cruise Control and it works just the same as in any other car that has the system. You set a specific speed the car needs to maintain, but if another car is in front of yours its radar makes you hold a set distance (selectable between 7 and 1, ranging from suite a distance, to full “BMW mode” 😉 ) If the car in front of you slows down, your car simply follows that move and keeps the same distance so you don’t run into it. It can even bring you to a complete stop if necessary and can do an emergency stop in case of a distracted driver, for example. A nice safety feature in the first place. Again, this is a feature that works similarly to other cars that have had this capability for quite some time. So Tesla was kind of catching up to the others. But instead of simply catching up, tesla has leapfrogged the competition by taking it one step further. Like in most cars you drive by the parking spot and the car alerts you to an open position. Then you select reverse and that’s where the similarities end. With another car the car does the turning, but you have to accellerate and brake, put it in drive again and position the car in the parking space. In a Tesla, you simply hit a button on the massive center touchscreen and the car parks itself, controlling steering, gear and throttle all by itself, with you as a passive driver, only needing to intervene if something unexpected occurs. At the time of writing this blog post auto steer is still in beta, but it is already an awesome feature and I can’t wait for the glitches to be resolved and the system improving even more. 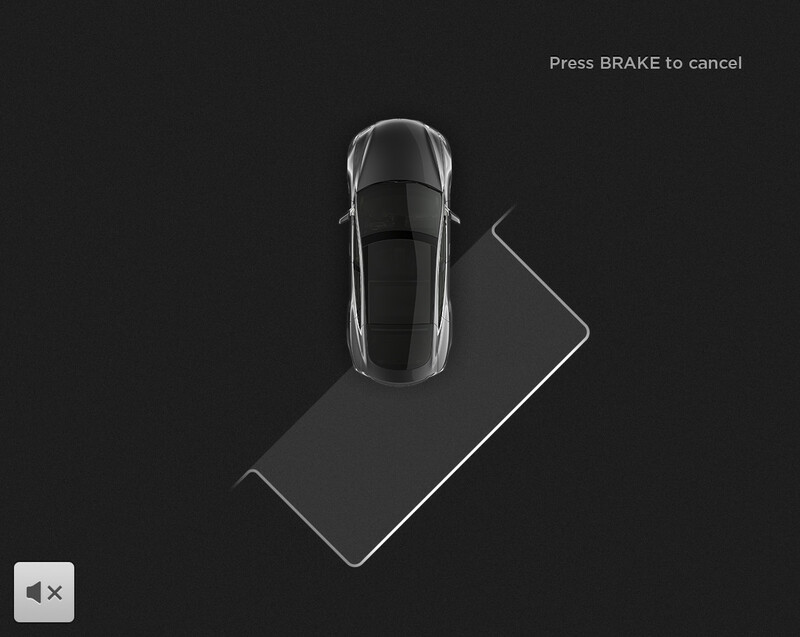 But for now, it looks a lot like the Lane Assist that you find on other cars to keep you in your lane. Mercedes has this traffic jam assist that drives the car all by itself at low speeds so,in traffic jams you are no longer burdened with constantly stopping and going. Tesla has the same capabilities, but again, that is where the similarities with existing systems ends. Tesla allows this capability to take over steering completely at higher speeds as well, up to 150kph even! There are some situations where it doesn’t work (well), but I’ll get to that in a minute. The last main feature of the AutoPilot system is the ability of the car to change lanes all by itself, just by enabling the blinker. It works in both directions and when you activate it (only possible when AutoSteer is active) the car checks for you if it is safe to change lanes and when it is it changes 1 lane in the indicated direction. So for moving up 2 lanes, you need to activate it twice. That sounds awesome, but how good is it really? Well, it depends on a lot of things how good the system works. TACC works great in most cases, but when a car cuts you of, I find it reacts to slowly. Also, when a car comes in between you and the car in front but with enough room in between, it takes a good part of the car to be in your lane before it detects it and adjust the distance to follow the merging car. I understand these are circumstances that the current hardware suite cannot detect. The radar has a rather narrow beam, focussed on long range capability instead of short and wide range. I might be msitaking, but the front camera has limited depth view because it is not stereoscopic. It does have depth information, but I assume not enough to account for such situations. So there lies one of the problems with the whole system: the current hardware suite is not sufficient to make it as good as it could be. But I’m sure the continuous improvement strategy from Tesla will fix that in the next hardware iteration of the cars. Then we come to AutoPark. While it does go one step further than other brands, the proble is that currently it only works when you want to park in between 2 cars AND the car has to detect some kind of curb too. If there is only 1 car and you want to parallel park (because there is a pole on the othe side of the parking spot so you can drive in forwards, for example), the system doesn’t work. If the parking space has a bike lane behind it, so ther’s no curb, the system doesn’t work. That’s a shame, but again, I’m sure it will be updated in the future and my car will get a little bit better yet again. I do still have issues with the Auto Lane Change feature in the sense that I don’t get it. Yes, it does perform an additional check before actually turning. But in Europe we got a different version of the software that needs you to firmly hold the steering wheel before it activates. So for me, I might as well do the lane change myself. For me, this provides little added value. And then we come to “la pièce de résistance”: AutoSteer. 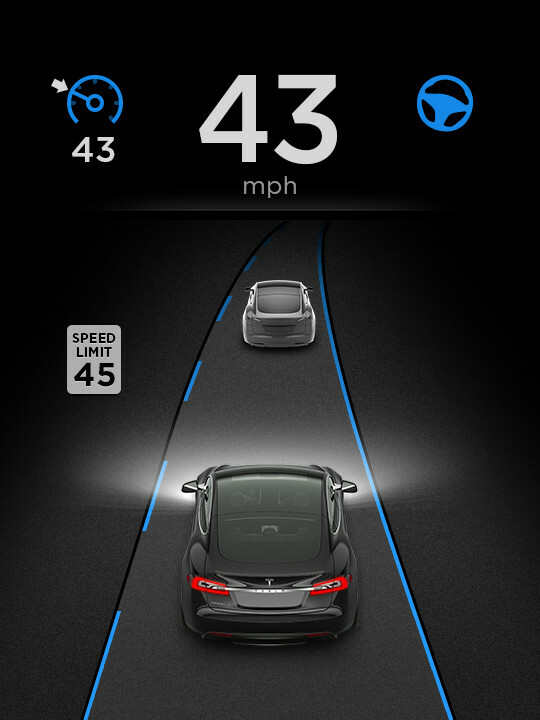 This is the killer feature that puts Tesla in the lead of moving towards autonomous vehicles. Before I go any further I should clarify that this feature (with the combination of the others) is NOT auntonomous driving! The system still needs clear supervision by the driver, even do it can handle a lot of situations. So if you have the capability in your own Tesla, please don’t do stupid things like climbing in the back seat or reading the newspaper while driving! And if you do feel the uncontrollable urge to do so, don’t film it and put it on YouTube. If too many people vbehave like this, gioverments will put a ban on AutoPilot and you will be punishing all of us other drivers by taking it away from us who use it wisely. Just don’t do it! Disclaimer: This doesn’t mean that I haven’t tested the system limits. I’m a curious guy like any other, but when I did, it was under controlled environments, on empty roads, with hands hovering millimeters above the steering wheel, ready to take over in an instant. You don’t need to climb in the back seat to prove the car drives on its own, you know. Also, the feedback I had from my tests, I clearly wrote them down with example situations where it did and did not perform as expected and sent it to Tesla support for them to use it to improve the system. But enough ranting. How good is it in real life? It copes with most situations rather well. The system claerly needs well marked lanes to operate efficiently and it does work best on highways (for which it is primarily designed). It does work on major roads and some smaller back roads, but having no lines and oncoming traffic on a road with single lines in each direction is a big “no-no” for AutoSteer. On the other hand, when used as advertised and as designed, the system performs really well and helps your drive to work or your road trip to be more relaxing, taking some of the more stressful parts off your hands. This leaves you with more time to be more attentive to your surroundings, or to enjoy the scenery, or even be more attentive to your fellow passengers (without loosing sight of traffic of course). Talking about road trips, as I mentiond in the beginning, I went on a road trip this weekend. First stop was Amsterdam. While the car is phenomenal to drive, I wanted to conduct an experiment. So as soon as I entered the highway I enabled AutoPilot and didn’t need to touch the steering wheel or pedals for the next 180 km, until I had to exit the highway in Amsterdam! 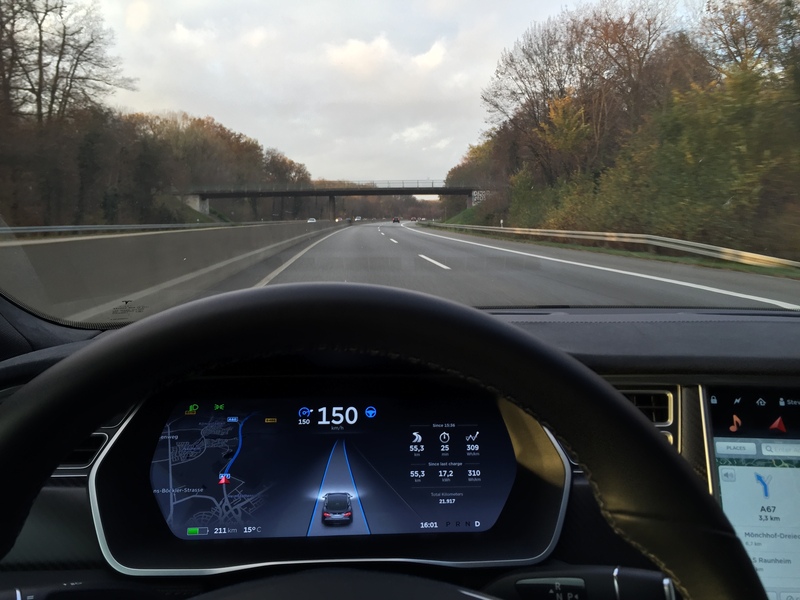 Next stop was in Stuttgart, a 600 km away and I wanted to use AutoPilot as much as possible. That meant using it in huge traffic jams, where the car follows the car in front of you due to lack of good sight on the lane markings and the fact that you’re driving below 30 kph. It also meant driving on an almost empty Autobahn at 150kph (maximum speed for AutoPilot) as a passenger in the driver’s seat. This is rather unnerving and I wouldn’t call it relaxing at all, but as an experiment and party trick it is awesome! And it also meant seeing how the system reacts to road works and shifting lane markings. Ther the system still needs a lot of work. It tries to follow the new markings, but as soon as you try to cross the old markings, the car panics and basically doesn’t know what to do. This is the point where you definitely need to take control over the car. Otherwise you will end up in a very bad situation. Driving in the rain doesn’t pose that much of a problem, as long as the rain isn’t too heavy and the car can still see the lane markings clearly. I’ve had section where I was in complete darkness on wet roads with light rain and the system kept working as if it were a bright and sunny day. Both with oncoming traffic shining their light on the wet roads (even on divided highways) the camera couldn’t see the markings anymore and the system prompted me to take control of the car, which I did. In the end I drove about 1600 km on this trip and of those, at least 1000km were on Autopilot, meaning I let the car drive me. There were only a handfull of occasions where the car prompted me to take control or where it paniced and urged me to take control. All other situations (curves, exits, lane splits) were either handled beautifully by the car or I noticed up front the car would have trouble navigating the situation, so I got ready and took control the instant I sensed it could react incorrectly. My respect for and understanding of the system has grown exponentially during this trip. All in all, AutoPilot is a fabulous system and keeping in mind this is still considered beta, I cannot wait until we get the final version downloaded to our cars of the future. I applaud Tesla for taking this brave step towards full autonomy and for not waiting until we get the complete autonomous car, like Google tries to do. Instead, the have a step-by-step appoach and that means that we can already benefit of a lot of the coolness, whil at the same time Tesla gets about 1 million miles of data back from the car to keep improving the system. That sounds like a win-win situation to me!